Qatar Airways has unveiled the opulent First Class cabin of their forthcoming Airbus A380 — and it's spectacular! Not only will it feature a lie-flat bed and a meeting space, it will also have 26-inch TVs — the industry's largest — at each seat. Qatar originally ordered 8 A380s in 2004, but added 5 more to the order in 2010. Ten years is a long time to wait for a new airplane, but Qatar will receive its first three A380s this June. 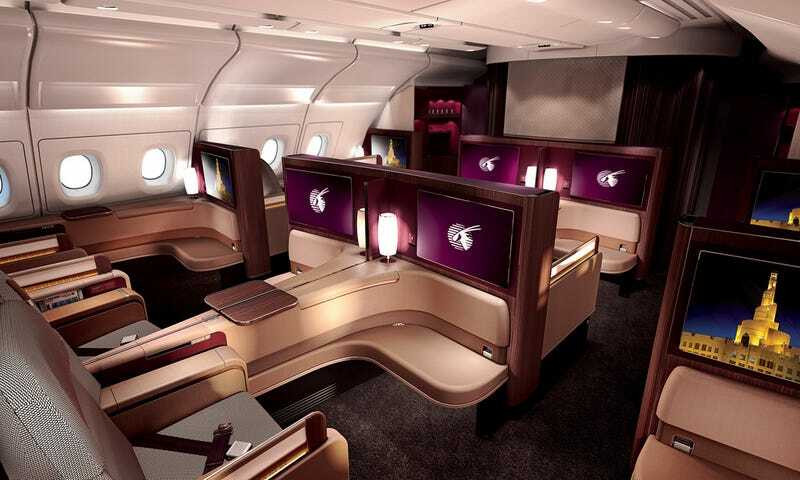 It will introduce the plane on service between Doha and London, according to CEO Akbar Al Baker. The airline says their First Class seats, provided by B/E Aerospace, are the widest in the industry. Each A380 will be equipped with eight First Class seats. Qatar's First Class Seat on the A380 is so roomy that two people can share the space for a meal or meeting. Passengers on board will also able to use wireless internet. "Our mission is to provide our passengers the best – whether it is comfort, cuisine, the most expansive route network, or the best connectivity. By introducing the A380 to our ever expanding young and modern fleet, we are keeping to our commitment of ensuring that our passengers have the best possible experience when travelling with Qatar Airways."